Dementia is a disorder that affects how the brain works and there can be a wide range of symptoms. For example, early symptoms of Alzheimer’s, the most common form of dementia, include minor memory problems and, as the condition progresses, disorientation, confusion and wandering. There is currently no cure, but carers and care providers understand that creating a supportive, person centred environment can promote independence and significantly improve the quality of life for people with dementia, especially in the early stages. The world of the person with dementia can be stressful and frustrating. Because memory loss and wandering, are particular problems, the use of purpose designed, dementia signage has an important role to play in helping people with orientation difficulties to find their way more easily and safely around the home. We offer high visibility signs to help people identify all the rooms within a care home, nursing home, hospital or even their home, not just the most important locations such as the toilet and bathroom. The signs feature the room name in a plain, easy to read typeface, usually black or white on a bold background colour to give maximum contrast and ensure visibility in every location. The room name is then reinforced by an easily identifiable image to further aid recognition. Made from durable, wipe clean, fire rated plastics, the signs have smooth edges and rounded corners for maximum safety. Directional signs with arrows are also available for residential homes and hospitals so that residents and patients can find their own way, without the feelings of stress or frustration that arise when forgetfulness is a symptom. Even a home in which a person has lived for many years can become a strange place, so we also offer a range of domestic room signs, as well as cupboard and drawer stickers. These help to promote independence and enable people to stay longer in their own home. Dementia is a growing problem, especially in care and nursing homes where estimates suggest that 60% of residents already have some form of dementia. Hospitals too must increasingly make provision for older people with dementia. Signs are available for all the main rooms within a residential home that residents and patients may wish to use. 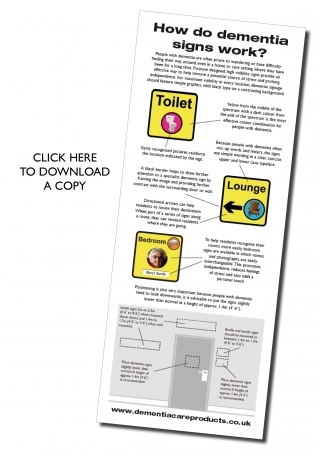 By guiding residents to the most frequently visited areas such as the lounge, dining room, garden and, most importantly, the toilet, these signs help to promote independence and self confidence. It can also help the home to run more efficiently and place fewer demands on staff. If residents are liable to wander aimlessly round the corridors, it’s important that they stay safe and are not able to enter unsupervised into areas, such as the kitchen, where they could come to harm. For this reason it is not advisable to have dementia signs for rooms/areas (e.g. kitchen, office, lifts) which residents should not visit unaccompanied. For the person with dementia, proper signage, therefore, can help to promote independence, boost confidence and contribute to their general feeling of well being.